Last week you learned how to make a suggestion, especially a negative suggestion, using the word “Let’s” or “Let’s not”. 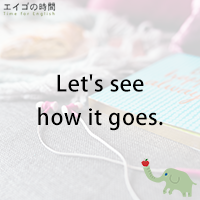 And I gave you some example sentences including “Let’s see how it goes”. The Macmillan dictionary says, the phrase “to see how it goes”, or you can also say “to see how things go”, is used for saying that a decision about a situation will be made after allowing it to develop for a period of time. In other words, you can use this phrase when you want to say it’s best to wait and see how things develop before doing anything or making any decision. For example, let’s say, you and your team work on a project. You want to see how it goes for a couple of weeks. If it works, that’s fine. If it doesn’t, you may want to make some adjustments or change the whole plan. Now, why don’t you try a quiz and see if you got the phrase right? Please listen carefully and choose the one that best describes the phrase “to see how it goes”. Ready? 1. wait before deciding what to do. 2. make a decision immediately.